After a particularly glutinous weekend, Sunday night I decided my parents and I needed something healthy to eat so we whipped up this Harvest Salad. It was filled with so many tasty ingredients, it will be a salad I recreate many times again. I loved the addition of dried apricots to the salad it is something I never think to use or eat. I usually use my old standby dried cranberries but the apricots were so good and I found out Sterling loves them too- I think he thought they were fruit chews but he gobbled them up. Next time I make this I may alter the dressing a bit and add a bit of Cayenne Pepper just to give it some extra heat and spice but the cinnamon was really nice in the dressing. This would be an excellent main meal with some grilled chicken on top of it. It presents beautifully too, so remember it next time you are entertaining and need a salad recipe! Cover apple slices with cold water. Add lemon juice. Let stand until ready to serve. Mix vinegar, honey and roasted cinnamon in small bowl with wire whisk. Gradually add oil, whisking until well blended. Add a pinch of salt and pepper. To serve, divide greens among 8 plates. 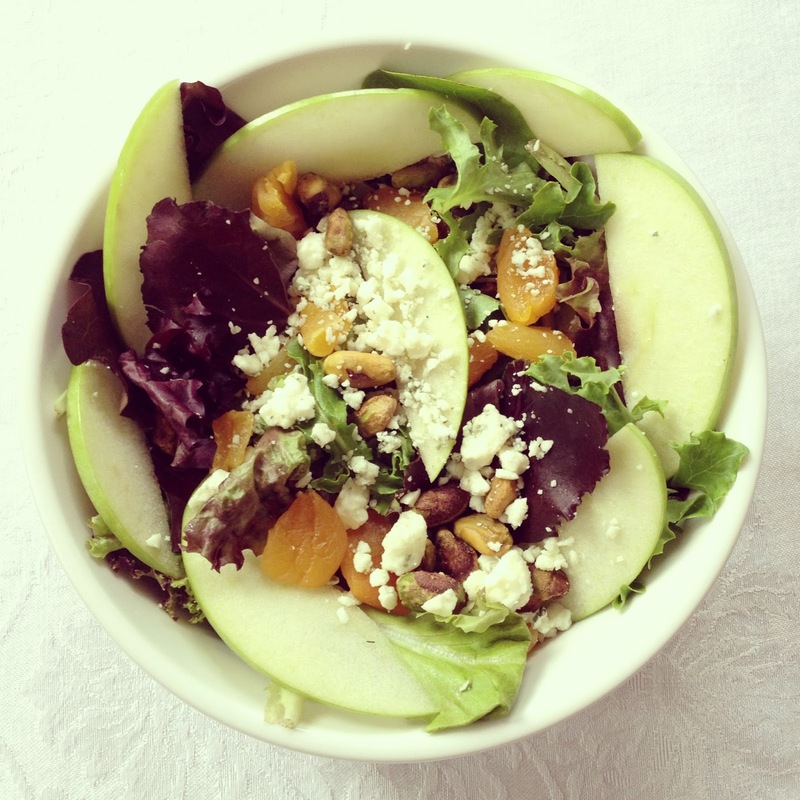 Top each with drained apple slices, apricots, blue cheese and pistachio nuts. Serve with dressing. You had me at Apple Cider Vinaigrette!!! That looks amazing. I need you to come whip up a few healthy dinner at my house! Looks SO good. I love s good, hearty salad. I'm definitely going to try it. Thanks :) and thanks again for the email too! I don't even like a salad, but this one has me drooling! looks delicious! One of my favorites! 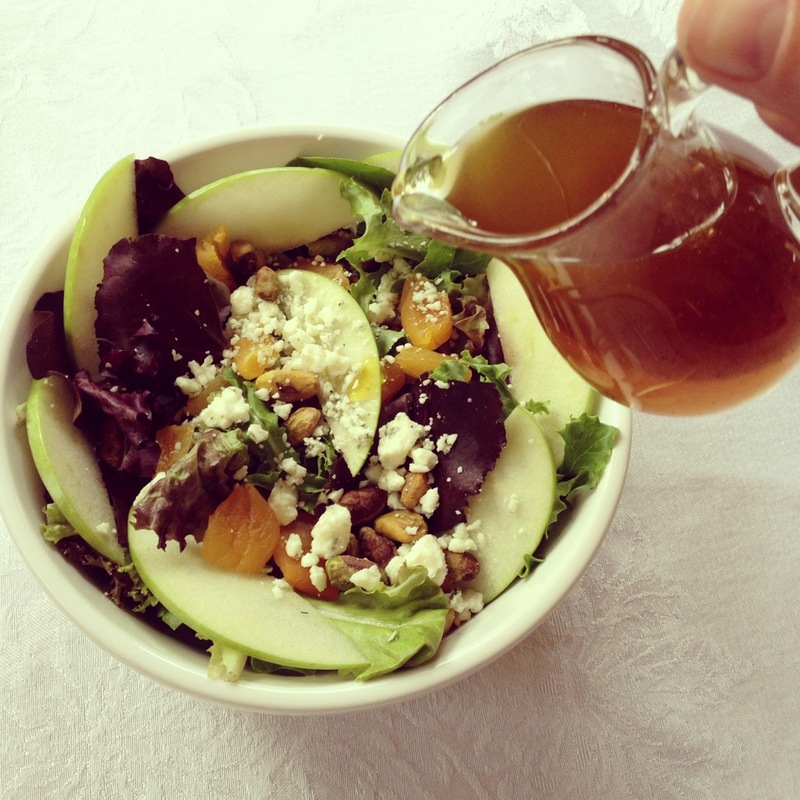 I love making apple cider vinaigrette. So fresh and yum! I swear the apples help you to feel full too! Looks and sounds amazing! Definitely want to try soon. This sounds so fresh and light and yummy. Can't wait to try. Yummy! 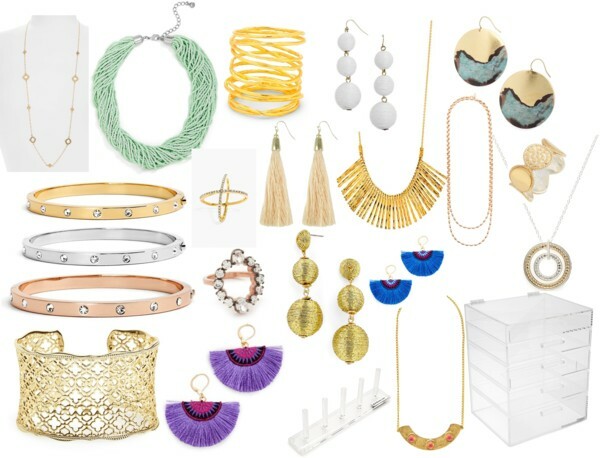 Will definitely be making asap...maybe with some butternut squash soup! The apricots sound amazing! I love a fresh dressing-will have to try this! That's my kind of salad! I'd love to have it for lunch today! my dad loves apple cider vinegar and I know he would love this salad - thanks so much for sharing! I pinned it! I'll definitely be giving this a try!